In my previous post I claimed that the ‘Greek crisis’ essentially is not about Greece, but rather that the crisis is a symptom of a bigger problem namely the euro itself. Furthermore, I claimed that had it not been for the euro we would not have had to have massive bailouts of countries and we would not have been in a seven years of recession in the euro zone and unemployment would have been (much) lower if we had had floating exchange rates in across Europe instead of what we could call the Monetary Strangulation Mechanism (MSM). It is of course impossible to say how the world would have looked had we had floating exchange rates instead of the MSM. However, luckily not all countries in Europe have joined the euro and the economic performance of these countries might give us a hint about how things could have been if we had never introduced the euro. So I have looked at the growth performance of the euro countries as well as on the European countries, which have had floating (or quasi-floating) exchange rates to compare ‘peggers’ with ‘floaters’. My sample is the euro countries and the countries with fixed exchange rates against the euro (Bulgaria and Denmark) and countries with floating exchange rates in the EU – the UK, Sweden, Poland, Hungary, the Czech Republic and Romania. Furthermore, I have included Switzerland as well as the EEA countries – Norway and Iceland (all with floating exchange rates). Finally I have included Greece’s neighbour Turkey, which also has a floating exchange rate. In all 31 European countries – all very different. Some countries are political dysfunctional and struggling with corruption (for example Romania or Turkey), while others are normally seen as relatively efficient economies with well-functioning labour and product markets and strong external balance and sound public finances like Denmark, Finland and the Netherland. Overall we can differentiate between two groups of countries – euro countries and euro peggers (the ‘red countries’) and the countries with more or less floating exchange rates (the ‘green countries’). The graph below shows the growth performance for these two groups of European countries in the period from 2007 (the year prior to the crisis hit) to 2015. 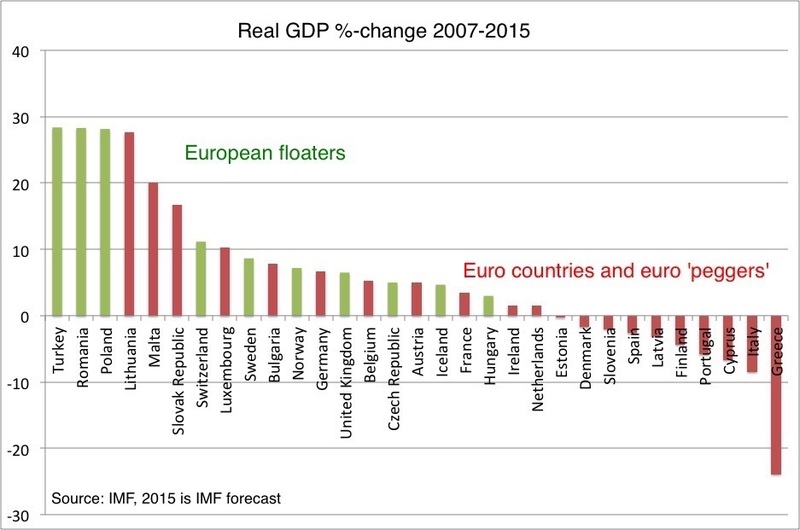 The difference is striking – among the 21 euro countries (including the two euro peggers) nearly half (10) of the countries today have lower real GDP levels than in 2007, while all of the floaters today have higher real GDP levels than in 2007. Even Iceland, which had a major banking collapse in 2008 and the always politically dysfunctionally and highly indebted Hungary (both with floating exchange rates) have outgrown the majority of euro countries (and euro peggers). In fact these two countries – the two slowest growing floaters – have outgrown the Netherlands, Denmark and Finland – countries which are always seen as examples of reform-oriented countries with über prudent policies and strong external balances and healthy public finances. If we look at a simple median of the growth rates of real GDP from 2007 until 2015 the floaters have significantly outgrown the euro countries by a factor of five (7.9% versus 1.5%). Even if we disregard the three fastest floaters (Turkey, Romania and Poland) the floaters still massively outperform the euro countries (6.5% versus 1.5%). To me there can be no doubt – the massive growth outperformance for floaters relative to the euro countries is no coincidence. The euro has been a Monetary Strangulation Mechanism and had we not had the euro the crisis in Europe would likely long ago have been over. In fact the crisis is essentially over for most of the ‘floaters’. We can debate why the euro has been such a growth killing machine – and I will look closer into that in coming posts – but there is no doubt that the crisis in Europe today has been caused by the euro itself rather than the mismanagement of individual economies. PS I am not claiming the structural factors are not important and I do not claim that all of the floaters have had great monetary policies. The only thing I claim is the the main factor for the underperformance of the euro countries is the euro itself. PPS one could argue that the German ‘D-mark’ is freely floating and all other euro countries essentially are pegged to the ‘D-mark’ and that this is the reason for Germany’s significant growth outperformance relative to most of the other euro countries. Update: With this post I have tried to demonstrate that the euro does not allow nominal adjustments for individual euro countries and asymmetrical shocks therefore will have negative effects. I am not making an argument about the long-term growth outlook for individual euro countries and I am not arguing that the euro zone forever will be doomed to low growth. The focus is on how the euro area has coped with the 2008 shock and the the aftermath. However, some have asked how my graph would look if you go back to 2000. Tim Lee has done the work for me – and you will see it doesn’t make much of a difference to the overall results. See here. Update II: The euro is not only a Monetary Strangulation Mechanism, but also a Fiscal Strangulation Mechanism.